When I first saw this game, I was quite sceptical as to how it would play out. 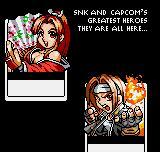 �A card game using SNK and Capcom characters? Come on! How could this be fun? !�, I asked myself. Upon playing it for about 1 1/2 months, it has become a pleasant surprise. Without getting too deep into specific details, the game plays very similar to the physical card game Magic: the gathering, with slightly simplified rules. The object of the game is to knock out your opponents deck by either reducing his or her stack of cards, or by playing past his or her defences and reducing his or her hit points to zero. Not an easy task, by any means. When a new player is beaten, new cards which you may or may not own already are obtained. 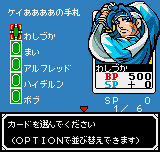 The graphics of the game are very detailed, with excellent artwork for many of the cards. Bright and vibrant colors are used throughout, and great attention to the expressions of individual characters are brought to light on each of the playing cards gathered throughout the game. Graphics walking around the game world are functional pokemon style lock block characters. These neither add nor subtract anything to the game. Game play is where this game really shines. 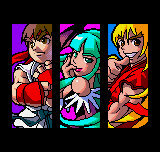 Like the fighting edition of SNK vs. Capcom on the Neo pocket color, the game play of this game is simply outstanding. The collecting nature of beating opponents and gathering cards really keeps you coming back for more. During the first week I owned this game, it has not been unusual for me to spend 6+ hours a day playing it. It is truly addictive and just as fun to play 1 1/2 months since the day I've gotten it. What further adds to the fun of the game, like many other pocket games, is the linkability. 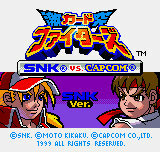 The game allows you to link up and trade the % of cards obtained with the fighting version of SNK vs. Capcom, Match of the Millennium for vs. points. You can also link up and play other people with the Capcom or SNK versions of Card Clash. 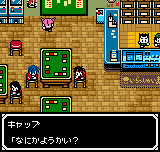 Besides linking up and trading cards with each other, betting matches and exhibition matches can be played for cards. Trading is especially useful when one person has the Capcom version and the other person has the SNK version, as cards in one version are easier to get than in the other. 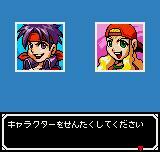 I cannot recommend Card Fighters Clash enough. The winning mix of familiar characters, stellar game play, and linkability make it a truly outstanding game. This is a true groundbreaking title that is perfect for portables. Many me-too games are scheduled to come out for the Gameboy color featuring monster rancher and pokemon, but will never measure up to this masterpiece of a game. Pick it up now. You will not be sorry.